The cable heater can be formed into a compact, coiled nozzle heater supplying a full 360 degrees of heat with optional distributed wattage. A straight cable heater can snake through an equipment application. Flat spiral configurations can be used in high-tech manufacturing while a star wound cable can be used for air and gas heating. 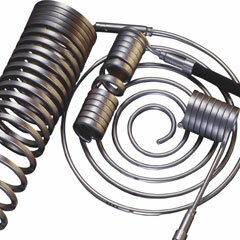 Whatever the application, the Watlow coil heater and cable heater can be shaped to fit.